The SGODDE waist trimmer belt is the perfect slimming aid for your firm stomach.It suitable for all kinds of training,whether jogging,weight lifting, Crossfit or other sports. 1.Promote weight loss:maintain core temperature of abdominal area during exercise,aid to repel sweat ,burn calories,and get rid of excessive water from your body. 2.Correct body posture:make you stand straight and enables you own a good body posture. 3.Relieve back injury:give you enough support，help you sit straight and promote blood circulation. 4.One size fits most:designed for both men and women,fit up to 38 inches. Size: one size fits most, 39'' Length x 8.9''Width.recommended for waist up to 38"
Application:Lumbar Muscle Strain, Lower back pain,body shaping,workouts. -Avoid use the washing machine dehydration, hot water washing is not available. 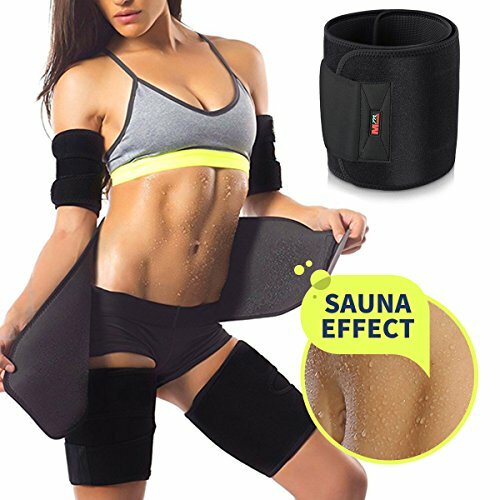 【LOSS WEIGHT FASTER】:this waist trimmer ab belt helps to increase core abdominal temperature during exercise and promote repel sweat ,burn the calories.Ideal for removing excessive water from your body,especially in the abdominal area.Contribute to loss weight by getting rid of water weight from body. 【BACK SUPPORT AND REDUCE INJURY】:The waist belt will give your back gentle support and correct your posture.Make you stand straighten,we all know a good body posture add so much on your overall confidence,personality ,and outlook on life.It can also offer support when you are working outs,relieve fatigue and lumbar injury when you sitting at office.You can wear it underneath your clothes whenever and wherever you go. 【ANTI-SLIP & LATEX FREE NEOPRENE】:The sauna belt is made of latex free flexible neoprene material.It can maintain a good grip around the customer's abdomen and makes direct contact with your skin to prevent it from sliding,suitable for waist ranging within 38 inches.You are allowed to adjust hook as well as loop closures based on your waist circumstance. 【UNISEX AND VERSATILE USE】:The belly burner belts is fit for both men and women.Its designed for you to enjoy postpartum recovery, sports, gym, body shaping etc.It's a perfect gift for everyone who wanna keep good posture or get a healthy body! 【COMFORTABLE EXPERIENCE BUT NOTE】:The lumbar belt is made out of Eco-friendly material,please keep your body hydrated while using the trimmer.Don't wear it too much of time, and less than three consecutive hours better.